Adam Le Fondre has scored 160 career league goals, but has endured a torrid time at Cardiff. 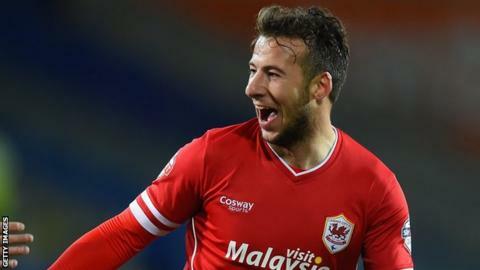 Cardiff City striker Adam Le Fondre has confirmed he is on his way out of the Championship club. The 28-year-old, signed from Reading in May 2014, spent the second half of 2014-15 on loan at Bolton after scoring just three times for the Bluebirds. Le Fondre now hopes to seal a permanent deal or a loan move away from Cardiff before the season starts in August. "We've come to an agreement where I won't be playing my football at Cardiff anymore," he said. "I'm just waiting for the perfect opportunity and the right club for me to go to. "I've turned down a few offers already. Geographically, it's got to be right for me and my family. It's going to be a more northern club that I will be signing for, but obviously you never know what comes in front of you. "I don't want this dragging on because it's sort of messing with my pre-season a little bit." Le Fondre featured in a Cardiff City XI which beat Carmarthen Town 1-0 in a friendly while the majority of the first team played in a 2-2 draw at Shrewsbury Town. Manager Russell Slade says the former Rotherham striker's future will "ideally" be sorted out before the Bluebirds host Fulham in their Championship opener on Saturday, 8 August. "Adam has made it quite clear that he would like a move to the north, whether that's permanent or on loan," said the 54-year-old. Le Fondre scored eight goals in 16 Championship starts after joining Bolton on loan in January 2015. Le Fondre, who has made 25 league and cup appearances for Cardiff, has been linked with a return to Bolton. "[Bolton] is a possibility, yes. [But] I think they're in a lot of [financial] problems. It's reported that they're in a lot of debt," he said. "I'm sure they would love to have me back there with what I did last season for them but I'm sure there are other clubs as well which could show me a possibility too." Some Bolton fans have now begun an online campaign to raise £500,000 to help their club sign the striker. Although the current total stands at just £575, the efforts of a small group of Trotters fans have drawn acclaim from Le Fondre. "It's brilliant. I just thought it was really impressive and touching. It's flattering to see things like that, that they care so much to want to bring me into Bolton," he said. "Obviously it's not nice for Cardiff fans because they don't know what's going on with me situation-wise, but as a player it's lovely to see things like that because it just shows how much you're loved." Le Fondre admits he needs to "rebuild" his reputation after a difficult spell at Cardiff City Stadium. "I don't regret my decision to join Cardiff, but my performances have not been good enough," he said. "It's probably a little bit of a black mark for me on my career. I've been a success at every club I've been at, apart from Cardiff. "That's probably a bitter taste in my mouth with regards to that because I'll look back in 10 years' time [or] 15 years' time and think what could have been, what should have been. "That's obviously going to be the case now because it's looking like I'm moving to pastures new. "I'm going to go there and try and score as many goals as possible and sort of reinvent myself."